The National Stadium rises high above the Vistulan horizon and rules on the calm bank of the river. It is really impressive, especially in the evening hours thanks to its shining floodlights. Before 2008, there was the 10th-Anniversary Stadium [Stadion X-lecia] which apart from being a sports facility was also a large trade area that gathered many traders of various origins. Over the years, it acquired the status of a cult spot in the city. Still, it was about for a change. The National Stadium was opened in 2012. It is a huge (81.5 metre high), modern sports facility. Two storey stands are enough room for 58 800 people. For concert purposes, it is possible to extend this number up to 72 900. 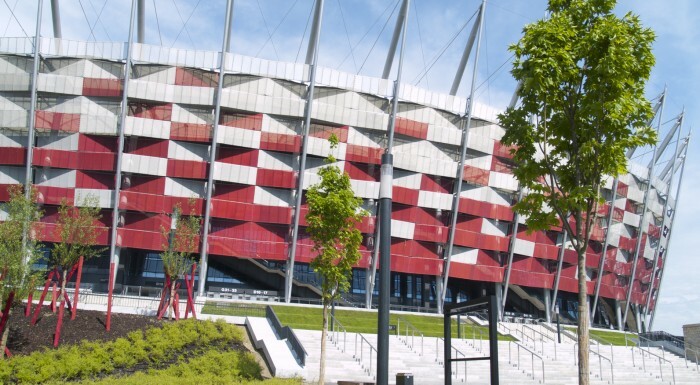 The stadium is equipped with VIP, business, and press boxes, under-soil heating, a modular turf, a training pitch, a lighted openwork facade, a retractable roof, and two parking lots (the underground one and the outdoor one). There are also restaurants, pubs, fitness clubs, business centres in the stadium. Also various improvements for the disabled are provided. 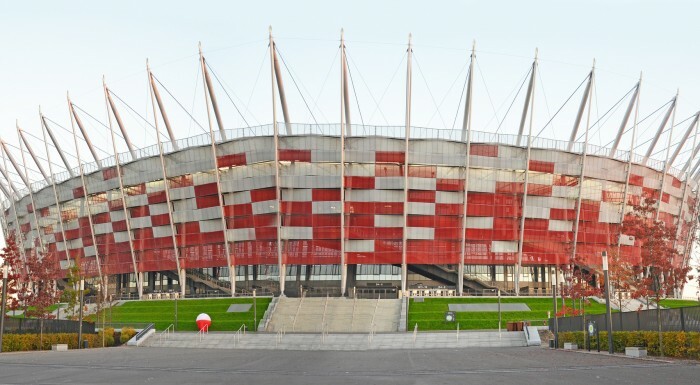 The silver-red facade of the stadium refers to a waving flag. Some people claim that it looks like a weaved wicker basket. Also, it was made sure that surroundings of the stadium are friendly and near to attractive green areas. The stadium offers thematic tours, but participating in large live events is the most exciting thing about the stadium. Crowds of people having fun, great atmosphere, and a modern facility full of conveniences build up positive emotions. Monday - Sunday 05:00 a.m. - 11:00 p.m. There is no need for yet another way of paiyng tribute to Polish heros and heroines.And if, it surely wouldn't be Plac Defilad. An artificial square in the place where tenament houses used to stand. Never rebuilt after the war because of the Soviet present in the form of Stalin Palace of Culture and Science. Plac Defiad was used in communism for all the people's holidays, army displays etc. You couldn't have chosen a less appropriate place.